few months For more than a year now, perpetual press reports, rumors and speculation have called the world's third kind of disc player everything from the "perfect compromise" to the "right machine at the wrong time." Cf course, the real value and virtues of VHD will only emerge when it takes the ultimate test-actual hands-on use outside of its hackers' research and development laboratories, once VHD players go on sale. 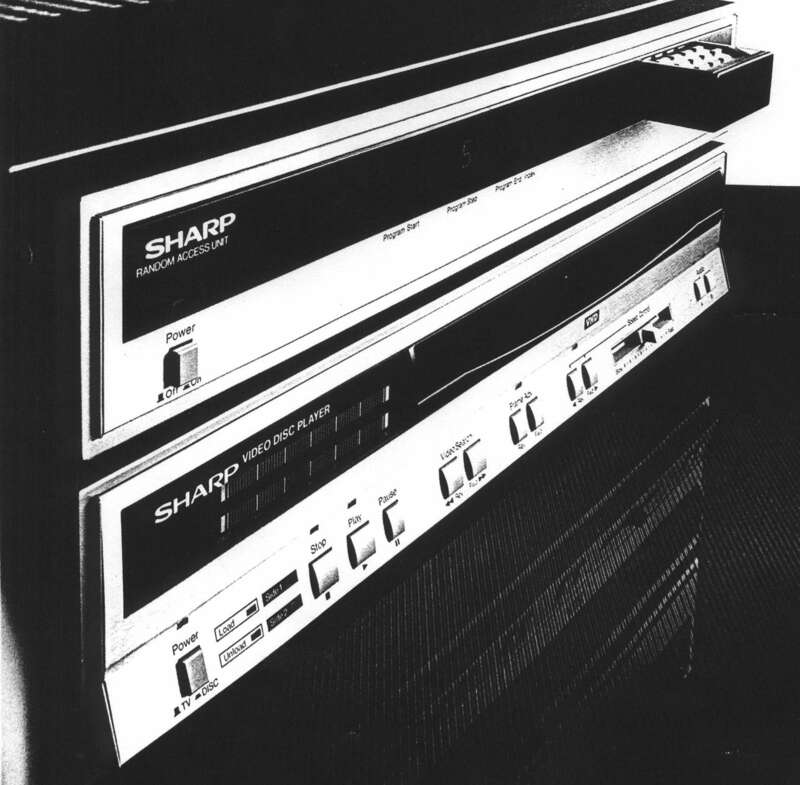 More than half a year in advance of that date, video Review arranged the first objective workout of a factory-model VHD player, through an exclusive agreement with Sharp Electronics. Once we started working with it, we were surprised to find that the only VHD player yet made available to the American press seemed vastly different from its spec-sheet descriptions and promotional renderings. When we took the player out of its box, we noticed it was a bit more compact than either a CED or an LV player (although Pioneer's LV player has random-access circuitry built in). Also, the player seemed to look more like today's audio equipment than most video gear-like something that could easily fit inconspicuously into the typical modem home. At first glance, the array of a dozen control buttons on the player's front panel made it look extremely com-plicated. when we inspected it more closely, though, we found that most of the buttons were the same as those on many VCRs: "Stop," "Play," "Pause," "Video Search" (for-ward and reverse visual scan), "Frame Advance" (forward and reverse single-frame advance) and "Speed Control" (for adjusting the disc speed to provide forward and reverse slow motion and visual scan). The non-locking, single-frame advance control also contributes freeze-frame capability. On the far left, there was also a "Power" button, with "Load/Unload" indicator lights to that button's immediate right, followed by "Side 1/Side 2" indicators. Above these was an illuminated scale that looked something like a radio dial, except it was calibrated to 60 minute designations. On the player's far right were "Audio A/B" buttons for choosing between single-channel (monaural) and dual-channel (stereo or bilingual) soundtracks. We plugged the player's power cord into a standard AC wall socket and, eschewing the supplied RF connec-tor, opted to connect the machine to a TV set equipped with a video-in jack. We then pressed the light-touch "Power" button and waited briefly for the "Load" indicator light to come on. Since channel 3 is unused in the New York area, we set the channel 3/4 switch on the top of the player accordingly in order to be able to watch discs on that "open" TV frequency. Now we were ready to insert a videodisc. Sharp had provided us with an elaborate demonstration disc-but not a test disc incorporating test patterns, color bars and all the other measurement tools necessary for an empirical, laboratory test report-in a package noticeably smaller than those of either of the other formats' discs. With VHD, as with CED, the disc package is a protec-tive plastic caddy. So, as we would with CED, we inserted the slim disc-and-caddy package into a wide, horizontal slot on the front of the player. The "Load" light went out and the "Side 1" indicator came on. Then we pulled the empty caddy out and pressed the "Play" button. On the calibrated dial, a moving indicator bar traveled from "off stage" to the dial's far left. The pro~ gram would begin in a few seconds. Basically, the narrator explained, the VHD format uses discs encoded with "micropits" (roughly analogous to an audio record's grooves) which, unlike both audio records and discs in the CED format, are "read" by a stylus with a smooth, flat head. This kind of head is designed to result in less wear than the CED format's needle-and-groove method, and it makes VHD players capable of simple, precise frame location. However, since there are two frames in each disc revolution, the only practical freeze framing possible is on sections of the disc that repeat the same image on a single revolution. So, the Sharp player has no freeze frame control per se; to achieve the next best thing to freeze-frame, Sharp told us it's necessary to push the single-frame advance button once. After pressing the Power' button on the far left of the VO 200 we hit the "Eject" button on the right, and out popped a somewhat forbidding-looking remote control. This module, it turned out, was the only set of con-trols the random access unit had! Pretty snazzy we thought-unless you misplace that calculator-sized module, that is. The remote duplicated all the con-trols on the player, except for Speed Control. Instead of one variable slide control, four buttons offered pro-gressively faster or slower steps of speed in forward and reverse. The remote also included a numeric keypad and buttons to program sequences and to reach specific points on a disc. Using the remote control, we returned the disc to its start and hit the remote controls "Play" button. The VO-200's display face, when completely lit up, revealed a "Stereo/Bilingual" indicator light, followed by two, five-digit, blue LED displays separated by a single-digit, red LED display. This VHD player's random-access capability, we discovered, does the LV format's one better. In addition to LV's random access by frame (or, as Sharp calls it, "page") number and "chapter" (or disc section) number, the Sharp player can reach points on a disc according to elapsed time. And while an LV player can reach chapters of a videodisc only with certain videodiscs so encoded, the Sharp player let us program our own "chapters." We were also able to mix and match these three different kinds of access methods by punching in "pro-grains" with set start and stop times. These "program step" numbers (you can punch in up to five programs) appear as the single red digits on the VO-200's display face. Without technical tests, we found the player's picture quality excellent, except during slow motion. The delay in VHD's introduction has ap-parently been related to the engineers' having to find the right chemical mixture for the videodisc material, and if the demo disc was any indication, the delay may prove worthwhile.